Shanghai (pop. 20 million+), like many of China’s other cities is choking under a blanket of filthy air. But now, a local landfill is undergoing a $103 million dollar renovation in an attempt to clean up the perpetual haze clouding Shanghai’s remarkable sky-line. The newly-founded Shanghai Huagang Wind Power Generation Co. is transforming the landfill into a state-of-the-art high capacity power plant. The planned fifteen 1.5-megawatt wind-powered generators will output 46.96 million kilowatt-hours a year; the same output produced using 12,000 tons of coal. According to Li Xin, a Shanghai Development official, “by 2010 the total wind power will be around 300 MW, two percent of the city’s total installed power capacity.” Although costly, Shanghai’s green efforts are definitely a step in the right direction. According to records, China had 62 wind farms outputting 1,266 MW of energy at the end of 2005. 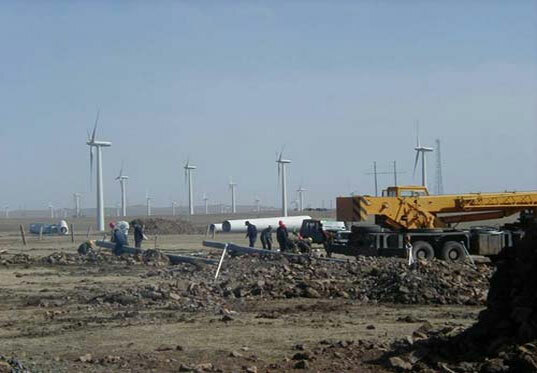 They hope to reach 5,000 MW in 2010 and 30,000 MW in 2020—wind power will then account for 3% of China’s power needs. Too bad those wind generators were bought from China. If we had built them ourselves, we could have been more self-sufficient. can't agree with you enough Ramsey about lack of knowledge concerning the actual *science* behind climate change and the technology that can be of benefit with regard to addressing it. however, photovolatic cells and ethanol aren't all bad, you just have to use them in the right way. for example, a company called Solar Systems is about to build the world's biggest solar electricity plant in the state of Victoria in Australia, but they're not just big cells pointed at the sky. the actual PV cell is very small (and very efficient, from NASA i believe) but there is a wide field of mirrors around it that point at the PV cell and thus increase it's efficiency massively. also, less energy and money are required to build a whole bunch of mirrors than the equivalent amount of PV cells. also in Australia, the ANU along with a commercial partner have developed much cheaper solar cells, called Sliver. not sure if they're on the market yet, but they're a comin'. but generally, PV cells are seriously inefficient, more inefficient than coal even, which is really saying something! as for hydrogen, it is a total waste of energy to use it in an internal combustion type engine, for the two very simple reasons that internal combustion engines are horribly inefficient (about 20%) and because it actually takes more energy to *make* hydrogen than you get from the hydrogen itself. then there are the added issues such as it being extremely difficult and energy intensive to store safely, and it begins to look pretty dreadful. however, hydrogen powered fuel cells aren't so bad, they're much more efficient than internal combustion engines. however, you can also run a fuel cell off ethanol, which is easier to manufacture than hydrogen. also on the issue of solar, solar thermal is pretty good. it isn't anywhere near as expensive to set up as solar photovoltaic is for a start and it just uses the sun's heat to do what coal or natural gas already do, power turbines which generate electricity. the added bonus of this is of course the fact that you can couple a solar thermal power plant to a combined cycle natural gas generator which can up production if necessary at any given moment. not sure about hydro, apparently there are very few sites left in the world that are suitable unfortunately. just to bring up another point about the lack of understanding about the science behind various forms of technology. the next time someone poo-poohs a nuclear power plant because of the dangerous radioactive waste it produces, tell them that a coal powered station pumps radioactive waste directly into the air we breathe at 10 times the rate of a nuclear plant. i'm not saying nuclear is good (though thorium deserves to be looked at, it decays after about 500 years and you can't make bombs out of it, precisely the reason it wasn't used for electricity generation in the first place unfortunately), obviously being exposed to nuclear radiation is bad. but people shouldn't just point the finger at nuclear power plants with regard to endangering our health and safety, coal not only produces huge amounts of carbon dioxide it is also radioactive. back to the original topic though, it is great that China is being so proactive. if only the governments of Australia and the US were as proactive, but they're still obsessed with China being "bad" but really, they're much, much worse. This is good, stop the polutions even in the rest of the world. Our absolute brand new WINDPOWERTECHNIQUE will schocking the rest of the world. This new technique will be the sensation for all user of electric power and the architects as well as the constructors will be very happy. This technique is able to be integrated in any building and can´t be seen at all. In areas with wind velocities that average over ten meters per second wind is an attractive alternative with costs that rival most other energy sources. As more major players like China enter the market the price will be driven down even further as economies of scale are reached. Social activists and politicians are often too poorly versed in technology to develop energy policy, chasing after questionable alternatives like ethanol and photovoltaic, and missing the vastly underutilized and more sensible wind and hydroelectric sources available. cleaner energy and less allergy. sounds like a win win. although "costly" is a tricky word. fix costs of installation, tech input, and later the flexible costs such as maintenance and upgrade, all could be a bite too big, probably more than shanghai can chew. we all get the message - it's all for the long term benefit. but without first A. delivering a more structured and efficient taxing system B. closer analysis and monitor of government expense and C. building a sustainable social welfare system, all of the overspending could lead to a social crisis sooner than a natural one. it takes more than better technology and design to solve our problems, especially for developing countries with such complex socio-economical environments. designers must also function as (or cooperate with) social activists, economists, ambassadors, even politicians, to bring about changes. Shanghai (pop. 20 million+), like many of China's other cities is choking under a blanket of filthy air. But now, a local landfill is undergoing a $103 million dollar renovation in an attempt to clean up the perpetual haze clouding Shanghai's remarkable sky-line. The newly-founded Shanghai Huagang Wind Power Generation Co. is transforming the landfill into a state-of-the-art high capacity power plant.